THE Chinese former business partner of NSW red meat processor, Bindaree beef has been slammed in the Federal Senate for avoiding a $31 million fine imposed earlier by the Supreme Court of NSW. Beef Central published this article in November, covering the Supreme Court’s original ruling that Chinese state-owned Chinatex Australia Pty Ltd had to pay Bindaree $31.35 million for reneging on beef supply deals. Bindaree has since gone back to court pursuing payment of the penalty, but parent company, COFCO (China National Cereals, Oils and Foodstuffs Corp) has apparently stripped Chinatex Australia of its assets, in order to escape payment. The development is not a good look for COFCO, one of China’s largest agricultural conglomerates, which does a lot of business in Australia, and owns Tully Sugar in Queensland, which it acquired in 2011 for $145 million. 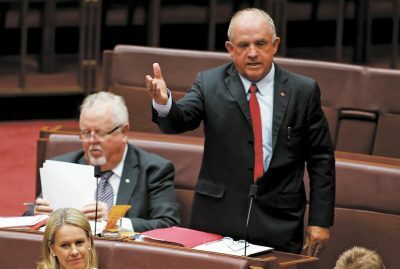 Sen Williams said he had followed the litigation closely, as it involved Bindaree Beef, which operated an abattoir in his home town of Inverell, employing around 800 people. In 2015 Bindaree Beef entered into a three-year service kill agreement with Chinatex Australia, but Chinatex immediately defaulted, when cattle prices in Australia rose. In May 2016, following continued breaches by Chinatex, Bindaree terminated the agreement, and in June that year commenced proceedings in the Supreme Court. “This is very interesting,” Sen Willaims said. “Prior to the judgement being delivered, Chinatex Australia transferred its shares in its wholly owned Australian subsidiary called Unibale Pty Ltd to a related party corporate called Chinatex Fortune, which is a Hong Kong based company,” he said. Unibale was a registered owner of significant irrigated properties and water licences in the Moree area of north-western NSW, and the size of the transfer to Chinatex Fortune was just over $38 million. “This transfer of shares occurred after the court case commenced and before the judgement was handed down,” Sen Williams told the Senate last night. In November last year, the Supreme Court found in Bindaree Beef’s favour and awarded $31.35 million plus interest plus court costs. A series of court manoeuvres followed, including Chinatex filing an appeal and Bindaree Beef commencing proceedings to have the transfer of the Unibale shares voided, on the basis that the transfer was an abuse of process that was intended to defraud Bindaree of the judgement debt. Bindaree also successfully obtained freezing orders against Chinatex Australia and Unibale. In February this year, the court ruled that freezing orders in place against Chinatex Australia and Unibale since 1 December2017 were to continue. Presiding judge Justice Ball said in relation to the Unibale shares: “There is no evidence of what happened to the $38,035,217, except that all or most of it is no longer held by Chinatex. What’s more, that evidence strongly suggests that the sale of the shares was made to defraud creditors and Bindaree, in particular,” he said. “There are good reasons for thinking that members of the Chinatex group have taken steps to frustrate the court’s processes by taking steps to ensure that the original judgment will go unsatisfied,” Justice Ball said. Chinatex Australia’s audited accounts for 2015 showed that it was dependent on the ongoing support and funding from its parent entity, Chinatex Corporation, Sen Williams told the Senate. However Chinatex Australia had submitted to the Supreme Court that its financial position was such that it could not meet the judgment debt, with the result that if a stay is not granted, it is likely to be placed into liquidation. “So the question must be asked if Chinatex Corporation is indeed still continuing to provide the financial support, and, if not, why not?” Se Williams said. “On the basis of the comments of the judges who have heard the evidence so far, it should be of great concern to all Australian companies who do business with Chinese state-owned companies,” he said. Sen Williams said he intended to raise the matter with the Ministers for Foreign Affairs and Trade, and provide briefing updates to them as matters progressed. “They need to know how this Australian company is being treated and that it faces the real prospect of not getting the money the Supreme Court says it is owed. I will not stand by and watch an Australian company, employing people in our local town and pouring millions of dollars into the NSW regional economy, being treated this way,” he said. “If you do business in Australia, then you must act as a good corporate citizen,” Sen Williams said. COFCO’s website says it has total assets of 537.36 billion RMB, annual revenue of 442.65 billion RMB, total annual turnover of 150 million tons, a global storage capacity of 31 million tons, an annual processing capacity of 90 million tons, and an annual port transit capacity of 65 million tons. In China alone, COFCO has an integrated processing capacity of more than 60 million tons. COFCO is China’s largest food processing company, with products covering all the main categories of Chinese daily consumption, including rice, wheat, corn, oil and oilseeds, sugar, cotton, meat products, dairy products, wine, tea, and so on. COFCO has 2.3 million terminal sale points throughout China’s 952 large and medium-sized cities and more than 10,000 counties and villages, capable of providing consumers with a sufficient supply of quality and safe food year-round. Malcolm Turnbull and Barnaby Joyce say we need foreign capital for further development and this is a prime illustration where foreigners treat our judicial system with contempt. Were an Australian company to do the same in China the Directors would get twenty years jail. The Federal government should pursue the company directors of Chinatex for fraud and seek extradition orders.